High quality allergy filters are not costly and provide a big help for allergy sufferers. Limiting contact with pollen, mold and pet dander in your home can improve your air quality and lessen allergy symptoms. How much? $75-150, depending on size and type. When you spend more time inside the home, be sure to clean or replace your air filters regularly. Remove dirt from ceiling fans and keep your pets clean. The less dirt particles floating around your home, the better the air quality. Dry air can cause respiratory problems and increased allergy symptoms, especially in the winter. Dry air in your home can draw moisture out of porous materials like wood, including furniture, wood floors, pianos, etc. It also makes the air temperature feel cooler than humidified air. There are 2 main types of humidifiers: (1) small, portable humidifiers you can buy at your local store and (2) whole-house humidifiers that are permanently installed with your HVAC system. The Aprilaire 800 Steam Humidifier is a whole home humidifier. This product was installed Dec 2016, and can be added to any HVAC system. Runs quietly and maintenance is simple, you only replace the water canister. Controlled from your thermostat, you can regulate humidity when you need it to make your home more comfortable. UV Lights are less expensive alternative for indoor air purification and can be added to your system at any time. The APCO RT UV In-Duct Air purifier combines UV-C light with activated carbon cells. It reduces odors, toxic vapors, germs and mold. It is installed within your ventilation system. How does this work? The APCO RT UV-C Light reflects on a Matrix Shield Surface of Titianium Dioxide infused Activated Carbon which causes a Photocatylitic Reaction - transforming odor molecules into harmless Water Vapor and CO2. Mold, Germs and Viruses are sterlized by UV-C Light as they pass through it. How much? $585-785, depending on specific circumstances. Jaunsee installs advanced indoor air quality systems. With hospital grade technology, this Lennox system cleans the air in your home better than any other single system you can buy. 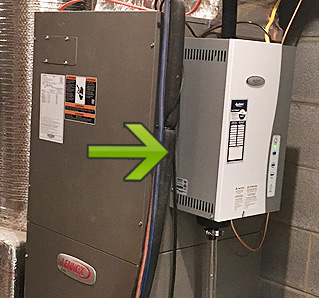 The Lennox PureAir Air Purification System pictured here was installed August 2013 on a Lennox Elite Heat Pump. Hospital-grade filtration and exclusive UVA-light technology. Many technologies available today only combat 1 or 2 classes of air contaminants. The PureAir air purification system is designed to combat all 3 for comprehensive air purification. Particles - Removes more than 95% of particles down to 0.3 micron, including dust, pollen and pet dander. Bioaerosols and Microorganisms - Removes more than 90% of bioaerosols down to 0.01 micron, including viruses, dust mites, bacteria, mold spores and fungi. Odors/Chemical Vapors - Destroys VOCs and odors from sources like cleaning supplies, solvents used in carpeting or furniture, paints, cooking smells and pet odors. Heating and Air Conditioning services from Richmond to Charlottesville. Maintenance, repair, replacement and installation.